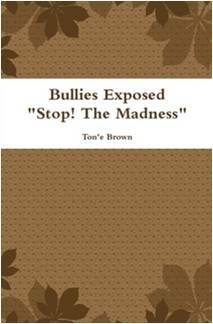 If you're among those who have found themselves a bit confused about how bullies are identified, Bullies Exposed "Stop! The Madness" is what you need to read. Yes, it’s gone on far too long. We have ignored it, given it excuses and even had the fear of confronting it. Why? Everyday someone is dealing with the discrimination of the unspeakable actions of a bully. This book takes you beyond the negative experience of a bully. This book exposes what’s been hidden for centuries. The school yard bully, the over powering family member that steals your self-worth in the name of love and the bully that abuses authority through intimidation. It is time to stop the madness of bullying. The question is no longer why the bully, bullies, it’s let’s identify who’s the bully and expose them. Bullies need to be exposed before there can be a healing process. Bullies need to know we are not taking it any more and it has to stop. Haven’t we lost enough of who we truly are to the person who killed our spirit through bullying? Isn’t time to save our children from the fear of life because of the threats and hurts of the actions of a bully? When is enough, enough? The purpose of writing this book is to enlighten the road for a new path. The futures of adults are at stake if a change doesn’t take place. The children of today will find it difficult to stand tomorrow if we don’t recognize what the affects of the bully is doing to them now. It’s time to wake up and address this matter and give it serious attention. We must help all forms of bullying to stop and begin a new era of reform behavior. Find self-worth again, feel the empowering of self-respect and start living life to the fullest potential that exist inside us. We can do this; we can share in the space with one another without the need to belittle. Believe me when I say, its time, rather it's you that's doing the bullying or you up against the bully. Go beyond your self imposed limitations by breaking the noose of in habitations. Identify the major enemies of your hidden abilities. Don’t live in that mental fear that holds you back because of the words or action imposed on you by a bully. You have to know that as an adult that bully still has a hold on you. Bullies have a way of stopping you dead in your tracks, even when the bullying is over and in the past, you still experience the emotion. You can begin to live again. Learn to live for today. No longer allow the haunting of a past bully or present bullies keep you from your divine destiny and purpose in life. It’s over; set new boundaries for your life and live life to the fullest.